Statistical correlation and seasonal comparative study of groundwater samples of Jaipur. Ground water samples were collected from different villages of Jaipur district, Rajasthan, (India). These water samples from 20 sampling points of Jaipur were analysed for their physicochemical characteristics. The water quality was analysed by pH, temperature, turbidity, Chloride, Sulphate, Fluoride, Alkalinity, Electrical conductivity (EC), total dissolved solids (TDS), dissolved oxygen (DO), chemical oxygen demand (COD). The results were compared with the results against drinking water quality standards laid by World Health Organization WHO (1993). For the statistical analysis, values of mean, standard deviations and correlation co-efficients (r) were also calculated for these water quality characteristics. Water is extremely essential for survival of all living organism. The quality of water is vital concern for mankind since it is directly linked with human welfare. In India, most of the population is dependent on groundwater as the only source of drinking water supply. Groundwater is believed to be comparatively much clean and free from pollution than surface water . But prolonged discharge of industrial effluents, domestic sewage use of fertilizers and pesticides, waste dump causes the groundwater to become polluted and creates health problems [2,3]. The problems of groundwater quality are much more acute in the areas which are densely populated, thickly industrialized, excess use of pesticides and fertilizers in rural area and shallow ground water tablets. The rapid growth of urban areas has further affected groundwater quality due to overexploitation of resources and improper waste disposal practices. Hence there is always a need for concern over the protection and management of groundwater quality. Considering the above aspects of groundwater contamination, the present study was undertaken to investigate the possible impact on the groundwater quality of Jaipur district of Rajasthan. Thus, in this paper an attempt has been made to assess the physical and chemical properties of groundwater. Jaipur, the capital and the largest city of Rajasthan, popularly known as the Pink City was founded by the Maharaja Sawai Jai Singh II, the king of Amber, on 18th November 1727. Being located at typical tropical region, the city of Jaipur has a hot semi-arid weather. Being a tropical country, the city could enjoy heavy rainfalls in monsoons but it is only limited up to 650 millimeters a year for the proximity to the desert. In between April and July, the average temperature rises up to 30 degree centigrade whereas in winter (November to February), the temperature falls down to 15 to 18 degree centigrade. The twenty groundwater samples from different hand pumps, tube wells and bore wells were analysed. Water samples were collected in cleaned and washed one litter bottles and brought to the laboratory for analysis. Water samples conducted during the months of Nov-Feb (winter season) and March-June (summer season) of year 2016-2017 from 10 different areas all around Jaipur District, (Table 1 and Figure 1) Rajasthan. Figure 1: Google map of study area showing sampling locations. Table 1. Sampling site and number of samples. In the present study pH has been measured soon after the collection of samples by a pH meter by electrometric method. The temperature is measured by the thermometer. Turbidity and Sulphate can be determined by spectrophotometric method. Conductivity of the different samples has been measured using a conductivity meter by electrometric method. Winkler method was used for the determination of dissolved oxygen in water samples. The analysis of the sample was done on the basis of standard methods suggested by the American Public Health Association. Total Solid content was determined by standard method. In the present study chloride content was determined by Titrimetric method. Total alkalinity and alkalinity due to carbonates, bicarbonates were estimated by titrating the sample with diluted H2SO4 using phenolphthalein as an indicator and methyl orange as an indicator .The titrate value gives phenolphthalein alkalinity (PA) and the second one gives total alkalinity (TA). COD is determined by using reflux condenser, ferroin indicator and titrating the sample with ferrous ammonium sulphate. Determination of fluoride is done by SPADNS method. The variation in physico-chemical characteristics of the ground water have been summarized in the Tables 2 and 3. Table 2. Analysis of groundwater quality parameters of winter season. Table 3. Analysis of groundwater quality parameters of summer season. Temperature is an important biologically significant factor, which plays an important role in the metabolic activities of the organism. The observe temperature was ranging from 31 to 23°C and 28 to 21°C during summer and winter season respectively. During present investigation the temperature was found to be significantly lower in the winter season than the summer and season. This might be the temperature of water changes with respect to season and environmental conditions . During winter, the temperature remains low due to cold low ambient temperature and shorter photo period . All chemical and biological reactions are directly dependent upon the pH of water system .The present finding of pH varied between rang 6.58 to 7.75 in winter and 6.75 to 7.97 in summer seasons. The turbidity is a measure of the extent to which light is either absorbed or scattered by suspended material in water. In present finding the turbidity values varied between 0.005 to 0.126 optical densities in winter and summer seasons, respectively. The highest value of turbidity is 0.126 optical densities in summer. Also water becomes turbid mainly due to the presence of colloidal and extremely fine dispersion . Dissolved oxygen is one of the important water quality parameter and it reflects the physical and biological processes prevailing in the water. The value of dissolve oxygen indicates the degree of pollution in water bodies . The observed values of dissolved oxygen is varied from 5.81 to 3.73 and 4.54 to 2.83 for winter and summer seasons, respectively (Figure 2). 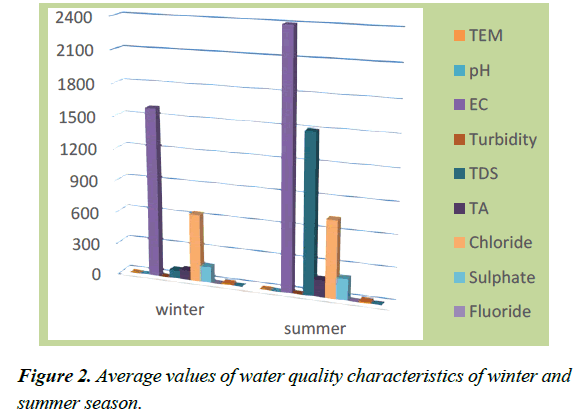 Figure 2: Average values of water quality characteristics of winter and summer season. The electrical conductivity of water depends upon the concentration of ions and its nutrient status. On the bases of electrical conductivity, the water quality can be classified as poor, medium or good . In the present investigation maximum conductivity was observed at 9120 to 1759 in winter season and 11830 to 912 in summer season. The total dissolved solids in water are due to presence of all inorganic and organic substances. The solids can be iron, manganese, magnesium, potassium, sodium, calcium, carbonates, bicarbonates, chlorides, phosphates and other minerals. The high values of TDS causes gastrointestinal irritation to the human beings but long time use of water with high TDS can cause kidney stones and heart diseases . In present finding maximum value for TDS was recorded at 507 to 213 mg/L in winter season and 7070 to 219 mg/L in summer season. The alkalinity in water is the cause of carbonate and Bicarbonate. Water samples from boreholes and hand dug wells had mean total alkalinity values of 202 to 532 mg/l in summer and 119 to 510 mg/l in winter seasons respectively. All the values of Alkalinity are beyond the permissible limit given by WHO (1993). In the present investigation, sulphate concentration was found to be in the range between 176 to 835 mg/L in winter season and 57 to 889 mg/L in summer season. The suitability of water resources for the drinking and irrigational use in agriculture is depending upon salt concentration, especially chloride content . Chloride usually occurs as NaCl, CaCl2 and MgCl2 in widely varying concentrations, in all natural waters. They enter water by solvent action of water on salts present in the soil, from polluting material like sewage and trade wastes. Chlorides when reaches concentration above 250mg/l; imparts an unacceptable taste to waters although no adverse effect have been observed on human beings regularly consuming water with much higher concentrations of chloride . The chloride concentration was found in the range between 3109 to 216 mg/L and 3519 to 85 mg/L in winter and summer season, respectively. During weathering and circulation of water in rocks and soils, fluorine is leached out and dissolved in ground water which increases the probability of high fluoride in drinking water. Excess intake of fluoride through drinking water causes fluorosis in human being. In present investigation fluoride concentration was observed in all samples sites in Jaipur. Chemical oxygen demand indicates the oxygen required for chemical oxidation of organic matter. The present findings revels that the value of COD varied in the range of 80 to 20 mg/L in winter season and 75 to 15 mg/L in summer season. The COD values at all sampling stations are exceeded the permissible limit (10 mg/L) according to WHO. High COD may cause oxygen depletion on account of decomposition of microbes to a level detrimental to aquatic life (Table 4). Table 4. Permissible limits prescribed by WHO. Correlation analysis: Correlation is the mutual relationship between two variables. Direct correlation exists when increase or decrease in the value of one parameter is related with a corresponding increase or decrease in the value of other parameter . The correlation coefficient (r) is the connection between two variables which shows how one variable predicts the other. It is the percentage of variance in the dependent variable explained by the independent variables. If high correlation coefficient (r) nearly 1 or -1 means good connection between two variables. A correlation coefficient r=0 that means there is no connection between two variables. The positive sign or values indicate the positive correlation similarly negative values indicate the negative correlation between two variables. The correlation and regression analysis is useful technique for interpretation of quality data of groundwater and relate them to specific hydro geological processes . These tools are quite useful for identification of the distribution patterns of different water quality parameters in groundwater samples. The correlation for different water quality parameters are presented in Tables 5 and 6. The results have shown that the correlation between dependent and independent water quality parameters, if P value is less than 0.05 i.e. (P<0.05), then the r value found to be significant. On the other hand if P value is more than 0.05 i.e. (P>0.05), then r value found to be non- significant (Table 7). Table 5: Statistical analysis of winter season. Table 6: Statistical analysis of summer season. Table 7: Average values and standard deviations of water quality characteristics. The present study has led to conclude that the quality of water samples studied were acceptable from the majority of the physicochemical parameters. Among the 20 water samples analyzed and all the important parameters when compared to standards prescribed by WHO. The values of the water quality parameters and the correlation coefficient will help in selecting proper treatment to minimize ground water pollution. There are variations in the physico-chemical parameters in underground water of village of Jaipur district studied in the year 2016-2017 shows higher values in the summer season and lower values in winter season. This is mainly due to over lifting of underground water for Agriculture, irrigation, cultivation, industrial activities and construction of buildings during the last four decades . The authors are equally grateful to the management and faculty members of Jayoti Vidyapeeth Women’s University, Jaipur for providing the valuable time for the continuous research work and also cooperation in collection of data and grateful guidance. Akinbile CO, Yusoff MS. Environmental impact of leachate pollution on groundwater supplies in Akure. Nigeria. International Journal of Environmental Science and Development. 2011;2(1):81-9. 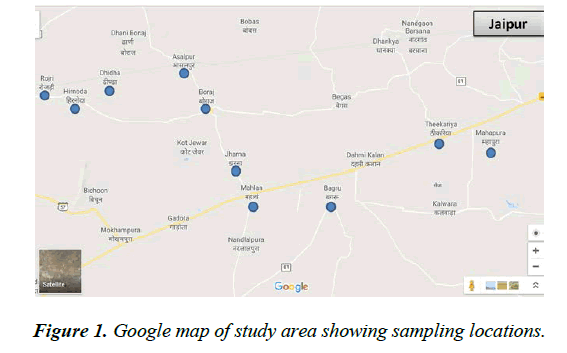 Ramakrishnaiah CR, Sadashivaiah C, Ranganna G. Assessment of water quality index for the Groundwater in Tumkur Taluk, Karnataka State, India. E-Journal of Chemistry. 2009;6(2):523-30. Raja RE, Sharmila L, Merlin P, et al. Physico-chemical analysis of some groundwater samples of Kotputli Town Jaipur, Rajasthan. Indian J Environ Prot. 2002;22(2):137. Bhalla G, Swamee PK, Kumar A, et al. Assessment of ground water quality near municipal solid waste landfill by an aggregate index method. Int J Environ Sci. 2012;2(2):1492-503. Verma P, Chandawat D, Gupta U, et al. Water quality analysis of an organically polluted lake by investigating different physical and chemical parameters. Int J of Res in Chem and Environ. 2012;2(1):105-11. Rao NS. Seasonal variation of groundwater quality in a part of Guntur District, Andhra Pradesh, India. Environmental Geology. 2006;49:413-29. Gopalkrushna MH. Determination of physicochemical parameters of surface water samples in and around Akot City. Int J of Res in Chem and Environ. 2011;1:183-7. Rajmohan N, Elango L. Nutrient chemistry of groundwater in an intensively irrigated region of a southern. Environmental Geology. 2005;47:820-830. Gulta DP, Sunita, Saharan JP. Physico chemical analysis of ground water of selected area of kaithal city (Haryana) India. Researcher. 2009;1(2):1-5. Jain CK, Kumar CP, Sharma MK. Ground water qualities of Ghataprabha command area Karnataka. Indian J Environ & Ecoplan. 2003;7(2):251-62. Dinesh AP, Rajesh GP. Study of some physicochemical parameters of drinking water sources in Tembhurkheda and Jarud region Dist. Amravati, India. Int Res J Environment Sci. 2013;2: 93-5. Vermani OP, Narula AK. Applied Chemistry: Theory and practice 2nd Ed. New Age Intenational Publishers Ltd., New Delhi, India.1995;2:65. Sivakumar AA, Jaganathan R. Hydrology of River Bhavani, Tamilnadu, India. Ecology and conservation of lakes, reservoirs and rivers. 2002:1246. Patil VT, Patil PR. Groundwater quality of open wells and tub wells around Amalner town of Jalgaon district, Maharashtra, India. E- J Chem. 2011;8(1):53-78. Saleem A, Dandigi MN, Vijay KK. Correlation and regression model for physicochemical quality of groundwater in the South Indian city of Gulbarga. Afr J of Environ Sci Technol. 2012;6(9):353-64. World Health Organization, Guidelines for drinking water quality-I, Recommendations. 2nd Ed. Geneva WHO. 1993.